Climate and Agriculture in the Southeast | How do scientists study ancient climates? How do scientists study ancient climates? If we want to understand the climate of the future, it is important that we first understand the climate of the past. Unfortunately, weather records only go back about 150 years. 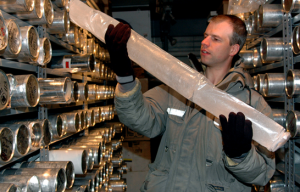 To look climates on longer time frames, we need the help of paleoclimatologists who look at proxy data like tree rings, lake and ocean sediments, and ice cores to help us decipher what the climate was hundreds and thousands of years ago. You can read more about how NOAA does this at https://www.ncei.noaa.gov/news/how-do-scientists-study-ancient-climates. Posted in Climate and Ag in the news, Climate science. Bookmark the permalink.